The Shelburne County Arts Council will launch its Public Art Policy on Thursday November 24, 7-9 pm by hosting an evening of brainstorming about the possibilities of public art in Shelburne County. While the evening will begin with the official launch of the policy, this part of the event will be quick so we can get to the brainstorming activities. These activities will include guided discussions meant to generate ideas about public art in our community, including locations, art concepts for those locations, inspirational examples, recommendations of talented artists, fundraising methods and other topics. SCAC encourages anyone interested in art, public art, community development and beautification, planning and related issues to attend. Participants are encouraged to bring ideas ready to discuss. The evening is meant to be fun and inspirational, as well as a next step in building a public art gallery for our community. SCAC developed its public art policy for its own purposes. The policy will help us create a public art program through which we hope to bring more art to our region. Staff member Darcy Rhyno wrote the policy after extensive research into the development and use of such policies across Canada and beyond. He's also been gathering examples of public art on his travels and from communities with public art programs. A slideshow of photographs from this research will loop during the evenings events. SCAC will make hard copies of its new policy available to take away for free. We wish to make the document available to any person or group that might find it useful. We encourage local municipalities to use the document as a template for the creation of their own public art programs. This free launch and brainstorming takes place in the Osprey Arts Centre theatre on Thursday November 24, 7-9 pm. Meet these world-class instrument makers living and working at their craft right here in Shelburne County, and hear about the art and science of flute making. 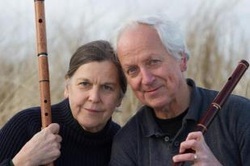 Forbes and Yola are passionate about creating the best wooden Celtic flutes. They work at tolerances of one thousandth of a millimeter at the same time as they design flutes that are works of art – choosing rare and expensive woods and crafting them elegantly. Centre and Shelburne County Archives and Genealogical Society. If you would like to apply, write a letter to SCAC that includes a brief description of your project, a budget of your costs that shows the amount you are requesting from the Council and a sample of your work. Mail it to the address on the CONTACT page. The Shelburne County Arts Council is open to applications for funding to support music and other sound recording projects by musicians and others with a Shelburne County connection. Supported projects can include demos and full length CDs by new or established artists working in any genre. The Council also has a record label – SCAC Records– which may or may not become part of a supported project. Support will be in the form of a loan, a grant or a combination of the two. Michael Isaac to visit county schools and public potluck this week. Mi’kmaw author and teacher Michael Isaac will read to kids at three Shelburne County Elementary schools and attend a public meet-and-greet potluck on October 20 and 21. The author of the children’s illustrated book called How the Cougar Came to be Called the Ghost Cat will meet kids at Lockeport Elementary School on Thursday October 20. The next morning, Isaac will read and speak to kids at Evelyn Richardson Memorial Elementary School in Woods Harbour and then visit Hillcrest Academy in Shelburne that afternoon. On the evening of October 20 starting at 6 pm, Isaac will attend an informal meet-and-greet potluck at the home of Kathleen Tudor who organized Isaac’s visit for the Shelburne County Arts Council. Members of the public are welcome to attend the potluck at 322 Pleasant Point Road near Lockeport. Michael Isaac is from the Listuguj First Nation near the border of Quebec and New Brunswick. Formerly a law enforcement officer and federal civil servant including at the Canadian Security Intelligent Service (CSIS), Isaac returned to Atlantic Canada to pursue a career in education. He now teaches within the Cape Breton Victoria Regional School Board. Illustrated book by Dozay (Arlene) Christmas and written in both Mi’kmaw and English, this is the story the difficulties of assimilation as experienced by First Nations peoples. Michael Isaac’s visit is funded with the help of a grant from the Canada Council for the Arts. The Shelburne County Arts Council is a local charity that serves artists and the arts in Shelburne County with the assistance of the Nova Scotia Department of Communities, Culture and Heritage. To find out more about the potluck, contact Kathleen Tudor at (902) 656-2446.